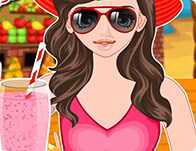 Play this cooking game for girls and learn how to do it in few easy steps. Ready ? Ok, let's start by separating the eggs then add in a bowl the eggs white with flour and water. Mix well the content and prepare the pancakes. Then follow the game instruction and create the content. Finally, create delicious chicken roll adding the content on pancakes and roll them well.